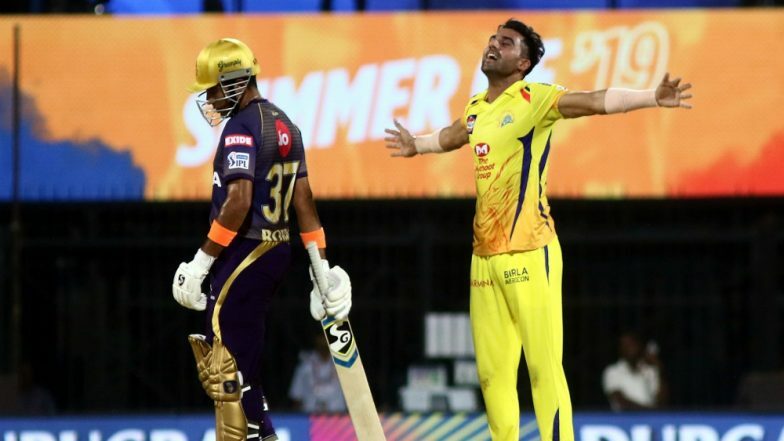 Chennai, April 10: Deepak Chahar took three wickets as Chennai Super Kings (CSK) restricted Kolkata Knight Riders (KKR) to 108/9 in 20 overs in an Indian Premier League encounter here on Tuesday. Chahar (3/20 in four overs) shaved off the KKR top order early and was well supported by veteran Harbhajan Singh (2/15 in four overs) who was very economical and Imran Tahir (2/21 in four overs) as Chennai never allowed the visitors to get an upper hand after they were asked to bat first by M.S. Dhoni. CSK beat KKR by 7 wickets | Kolkata Knight Riders vs Chennai Super Kings Live Cricket Score 23th T20 Match. The defending champions, led admirably by Dhoni, even kept Andre Russell quiet as the big-hitting West Indian scored 50 off 44 ball not out, his innings laced with five fours and three sixes. He first trapped Chris Lynn (0) in front to then account for the wicket of Nitish Rana (0) who hit a rising delivery straight to Ambati Rayudu at midwicket. In between those two wickets, Harbhajan continued his rich vein of form with the ball by removing Sunil Narine (6) with a tossed up delivery that the West Indian top-edged to Chahar who ran backwards from point to complete an excellent catch. The Rajasthan pacer then got the back of Robin Uthappa (11) who was guilty of trying to play one shot too many, and holing out to Kedar Jadhav at deep square leg. Russell and Piyush Chawla (8) joined hands for a 29-run stand for the seventh wicket but once Harbhajan sent the latter back with a delivery that spun sharply away from the batsman for Dhoni to effect an easy stumping, it was all downhill for the visitors.